This listing is for a paintball/airsoft target practice module with a loud siren and AC adapter. All you have to is tape the vibration sensor to the device that you are trying to hit with your projectile of choice, and the siren will go off when it. I'll speak on this below. 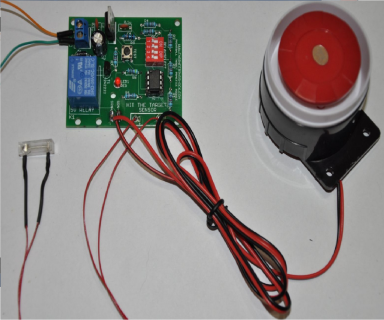 You can program the alarm duration from 1-15 seconds on the fly by adjusting the on board DIP switch orientation. This is talked about in detail in the above video. Consider this video to be your user manual. All units come fully assembled and tested in house. The siren and vibration sensor are connected to the board via long lengths of wire. said wires about about 1m in length. The main board has 5x mounting holes and can be mounted with ease. The siren has two mounting holes, and a double sided tape option on the back, so that you can stick the siren to any hard/clean surface with ease. The board takes less than 1mA in standby mode, and about 300mA when the alarm is going off. There is also an on-board TEST button that allows for you to test the duration of the alarm. Please note that the siren is VERY loud. If after watching the video, and reading the listing information you still have questions, please feel free to send us a question. We will do our very best to answer as soon as humanly possible! The power inputs to the main board are on a 2-pin terminal block. The ports are labelled V+ and GND. If you want to use your own power supply, DO NOT exceed 12VDC. The V+ port is where you connect your positive supply voltage. The GND port is your negative supply pin/DC ground pin. If you are using the included AC adapter, connect the red wire of the adapter to the VP port, and the black wire to the GND port. All DIP switches in OFF position: The siren will go off for one second per successful detected hit. Place Switch#4 in ON position: The siren will go off for three seconds per successful detected hit. Place Switch#3 in ON position: The siren will go off for five seconds per successful detected hit. Place Switch#2 in ON position: The siren will go off for ten seconds per successful detected hit. Place Switch#1 in ON position: The siren will go off for fifteen seconds per successful detected hit. Please note that if you place more than 1x switch in the ON position at any given time, the alarm duration may be variable. How to interface the sensor with your target. Use a piece of tape to connect the sensor to your target. DO NOT tape the sensor directly to the target, or it won't work. Apply a piece of tape to the wire side of the sensor about one inch below the sensor, so that the sensor is allowed the freedom to shake back and forth. The target should not be completely solid. Your target will need to shake for this to work. A garbage can lid will work, but that is only one of many options. If you are looking to run some tests before interface, turn the device on, set ALL of the DIP switches to the off position so that the duration of the siren per hit is only one second. Hold the sensor one inch below where the wires are connected. Then shake slightly. The siren should go off. Experiment before applying to your target. If you find that the siren is annoying you during test, simply put your spare hand over the siren head. 1x fully assembled board with vibration sensor and siren already interfaced. 1x AC adapter with stripped ends so that you can have the option of using it at a power supply. If you have any questions, or if you need anything specific, please don't hesitate to ask!